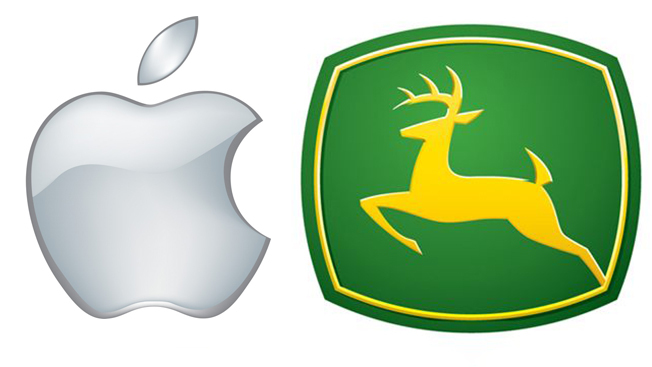 What’s the More Important American Tech Brand, Apple or John Deere? While Google has created huge hype in Silicon Valley for developing a self-driving car, John Deere has quietly sold monstrous self-driving tractors to farmers in flyover states during the past few years. The tractors steer themselves thanks to GPS software and a satellite or two. Yeah, even if you don't typically think of John Deere as a tech brand, that's exactly what it is: In the past several decades, the Moline, Ill.-based company has designed and manufactured a ridiculous number of planters, plows, discs, etc. that have helped the breadbasket region feed the nation. On the other hand, everyone knows that Google and Apple are revolutionizing lives through technological innovation. So at Advertising Week—since it is filled with iPhone-toting marketers/Mac fans—we thought it would be fun to pit Apple versus John Deere and asked a handful of attendees to choose which one is the more important American tech brand. Check out the responses to our social straw poll in the Instagram videos below.